even the leading extra strength! The function of vitamin B6 is to help the immune system produce antibodies. It is also responsible for keeping the nervous system functioning properly. Vitamin B6 is required for the synthesis of the neurotransmitters serotonin and norepinephrine and for myelin formation. Other benefits include increasing the amount of oxygen in the blood and helping to process carbohydrates in the body. Vitamin B6 helps maintain normal nerve function and is responsible for the formation of red blood cells. The body uses vitamin B6 to help break down proteins, so the more protein you eat, the more vitamin B6 you need. Since this water soluble vitamin dissolves in water, the leftover amounts leave the body. Because of this, it is recommended that people need a continuous supply of vitamin B6. This vitamin also plays a role in the production of amino acids, and is used in the creation of DNA. Deficiency of this vitamin can cause mouth and tongue sores, symptoms of irritability, confusion, and depression. Vitamin B6 can be found in beans, nuts, legumes, eggs, meats, fish, whole grains, and fortified breads and cereals. Vitamin B12 is frequently used in combination with other B vitamins in a vitamin B complex formulation and is involved in a variety of important functions. Vitamin B12's primary functions include the formation of red blood cells and the maintenance of a healthy nervous system. Besides helping maintain healthy nerve cells, it is also needed to make DNA, the genetic material in all cells. Vitamin B12 participates in the production of amino acids, and the processing of carbohydrates into energy. Vitamin B12 is also necessary for the rapid synthesis of DNA during cell division. Strict vegetarians or vegans who are not taking in proper amounts of this vitamin can be prone to a deficiency state. Vitamin B12 can be found in meat, dairy products and eggs. Niacin (Vitamin B3) assists in the functioning of the digestive system, skin, and nervous system. This essential vitamin is also important for the conversion of food to energy. Niacin, when used properly, offers benefits in terms of cholesterol reduction, as well as for detoxification. Niacin has also been shown to open small blood vessels and capillaries. Overall, the use of niacin to treat or prevent high levels of blood cholesterol and triglycerides and reduce the risk of cardiovascular disease is well substantiated by a variety of clinical trials. Since this water soluble vitamin dissolves in water, the leftover amounts leave the body. Because of this, it is recommended that people need a continuous supply of niacin. A deficiency of niacin may include symptoms of inflamed skin, digestive problems, and mental impairment. Niacin can be found in many foods, including yeast, meat, fish, milk, eggs, green vegetables, and cereal grains. Folic acid, also known as vitamin B9 or folacin is a water-soluble vitamin essential to many bodily functions such as producing healthy red blood cells and preventing anemia. Other benefits of folic acid include preventing heart disease and inhibiting colon cancer. Folic acid works with other complex vitamins to help break down certain proteins to form hemoglobin, the iron containing oxygen transport protein found in red blood cells. There have also been many studies and clinical trials surrounding the benefits of folic acid for pregnant women in helping to reduce premature births. Deficiency in folic acid can include symptoms of fatigue, weakness, irritability and depression. Folic acid can be found in fruits, green leafy vegetables, beans and nuts. There are physical and mental positive effects associated with the use of caffeine. Caffeine has been shown to increase the activity of the cardiovascular system and the digestive system. It also provides a sense of alert activity in the brain. Caffeine has been shown to elevate moods, which in turn increases work capacity and the performance of intellectual tasks. Caffeine can also increase the body’s temperature due to increased blood flow and muscle activity. 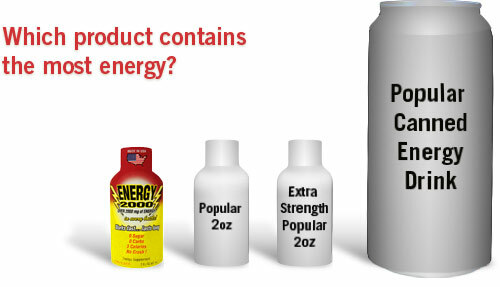 Within minutes of consumption, a drinker of caffeine feels more alert which helps to reduce symptoms of fatigue. 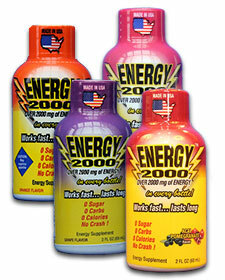 Energy 2000 contains caffeine comparable to a cup of premium coffee. The information provided herein should not be used for the diagnosis or treatment of any medical condition.